We barely, more like hardly ever fry things in the Porter house. So when we fill the need to indulge our main go-to is pan-fried or oven-fried. And today I have for you a yummy, tasty and might I add juicy pork chop recipe that will blow your mind. Try it today and you’ll see what I mean. Preheat oven to 425 degrees F (220 degrees C). Pour butter into a 9×13 inch baking pan. Stir together egg, milk, salt, pepper, garlic powder and onion powder. Dip pork chops in egg mixture, coat with stuffing mix/Italian bread crumbs and place in pan. Posted on January 18, 2013, in Lady Fab Cooks and tagged dinner, food, lunch, oven-fried, pork chops, recipe, the porter house grille. Bookmark the permalink. 34 Comments. This looks so yummy! I am making this now, as we speak; it’s in the oven and the smell is wonderful. I am having mashed potatoes and homemade applesauce with this, too. Are these boneless or bone-in pork chops and how thick do you use? Thanks! This is *really* very good! I found I didn’t need a full cup of bread crumbs; more like 3/4 cup for 7 thin cut boneless chops. Start w/ less, add more if needed (since the seasonings go into the egg mixture). Tender and great flavor. Thanks for sharing this keeper! What do I do with the melted butter? Good evening Jennifer. I place the melted butter I the baking dish before adding the pork chops. I followed the recipe but my porkchops came out with burnt edges and the breading is soggy in the middle of each pork chop. Tried this tonight. They were so good! Very yummy. Made this with thick pork chops. Found they were soggy after cooking for 15 min on both sides. So I put them on another sheet and put them back in the oven 450 for 8 minutes on both sides. I made these tonight and they were awesome!! I used 6 thin boneless chops and they turned out great. Very good. Nice flavor and very tender. Made these last night- Very easy and very yummy. I did not use thin porkchops though – just cooked them for 12 mins on each side. Sprinkled with Adobe seasoning before dipping the milk mixture. How do I make sure they don’t get soggy? Place your ribs on a cooling rack set inside a cookie or baking sheet to keep your ribs from being soggy or grease. Everything else is the same. I was a little bit sketchy about this recipe because I love fried pork chops so much but when I made this recipe it was absolutely delicious.. fantastic recipe and way healthier then using oil thank you so much.. I just made this recipe. It was very good, except for the fact that the pork chops didn’t have enough flavor. Next time I may season the pork chop directly and before putting on the crumbs. It is a new favorite for me. I love the fact that it isn’t fried, but tastes like it is. Thank you for the recipe. My husband had seconds; that is compliment in itself! Instant family favorite. I’m adding this to the rotation. I added ranch powder to the bread crumbs. Delicious! Thank you! I have cooked this so many times. Because my family loves it. Thank you for your recipe it’s awesomely delicious. How thick are the pork chops you use? I’m just not sure 10 minutes per side for a 1″ thick chop is sufficient. I am going to try your recip, but I’m still curious as to the thickness you use. 🙂 Thanks for the recipe! 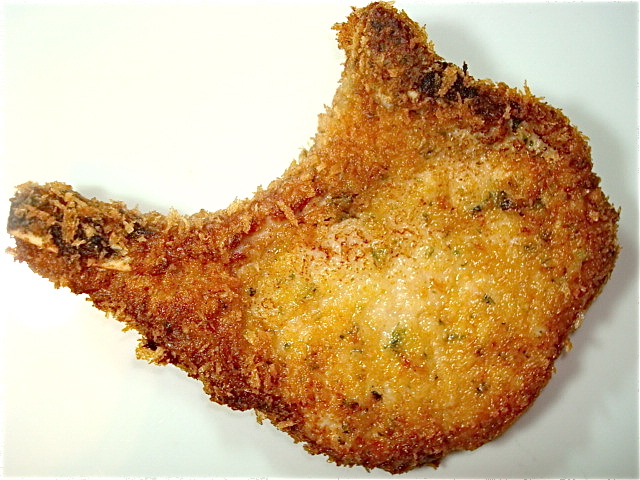 Glad you are going to try the recipe and I used bone-in breakfast pork chops for this recipe. Happy Cooking! Made this last night. It was good, but not quite as good as if they were fried, but it must be much less unhealthy to cook them this way. Also, not as messy. I’ll continue to use this recipe. My chops were boneless and about 3/4″ thick. They required about 5 more minutes total to cook all the way through. WOW! husband requested again! That’s a first for me. Thanks!! I’m not a good cook but this was truly easy.